As the coffee-house retailer's former CEO hits the airwaves to apologize and the company schedules a half-day for employee training addressing racial sensitivity, its reputation with the public has tumbled. Starbucks has had a rough week. Starbucks Corp.'s (SBUX - Get Report) apology tour may eventually include a check-in with its shareholders. One analyst told TheStreet on Wednesday that the coffee retailer could lose more than $6 million in sales on May 29, when it closes its 8,000 company-owned stores in the U.S. to train more than 175,000 employees in racial sensitivity in light of the arrest of two black men at a Philadelphia store on April 12. The training will be for a half-day in the afternoon the day after Memorial Day weekend. "It's safe to assume that the impact will be greater than the $6 million in sales it lost in 2008 retraining efforts, just because there are more stores in the chain now," R.J. Hottovy, an analyst at Morningstar, said on Wednesday. He also said that the stock price could slip in the near term and same store sales may fall for the year. The stock closed slightly down on Wednesday at $59.50. However, according to a back-of-the-envelope estimate done by TheStreet, lost sales on that day could exceed $8.7 million. TheStreet calculated the figure by dividing the number of all stores, 28,038, into the revenue for 2017 of $22.38 billion, which brought the number to $798,331, the average annual sales for a store. To get the average daily sales for a store, that number was divided by 365 days, which yielded $2,188. That number was then divided by two to account for a half-day, which brought the figure down to $1,094. Finally, TheStreet multiplied $1,094 by the number of stores to be closed, 8,000, to arrive at $8.7 million. When contacted by TheStreet, Starbucks declined to provide its own estimate of potential sales lost during the training or comment on the estimates. The company's reputation with consumers has tumbled to its lowest point in more than two years, reported YouGov Brand Index, a daily brand consumer perception company, on Wednesday. On the same day, former CEO Howard Schultz hit the airwaves on to apologize. Over the weekend, current CEO Kevin Johnson traveled to Philadelphia to meet with the two men and apologize face-to-face. 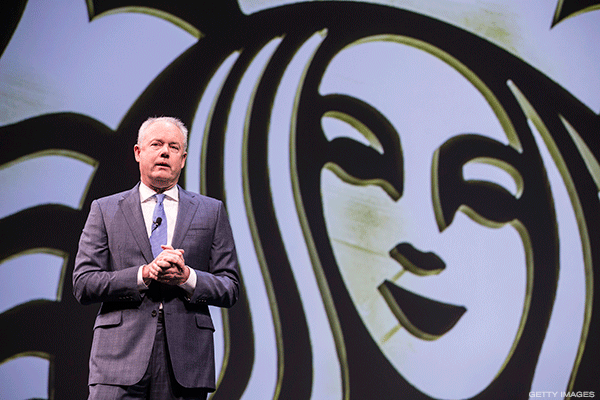 "Starbucks is being hurt by the intensity of the press," YouGov Global CEO Ted Mazilli told TheStreet on Wednesday. The company has been tracking customers' perceptions of Starbucks and 1,600 other American companies for 11 years. Mazilli said he thought current CEO Kevin Johnson has addressed the situation effectively, but that the fallout has continued because of the release of another video of a black man denied use of a bathroom at a California Starbucks on Tuesday, which had happened before the Philadelphia incident. What initially created the crisis for Starbucks was the arrest of two black men who were waiting for a friend at the Philadelphia store. A Starbucks employee called the police. As the police were arresting and handcuffing the men, customers filmed the incident and it went viral. Since last Friday, Starbucks' Buzz score fell from 13 to -8 on Tuesday, a drop of 21 points in four days, according to YouGov. When its 2015 Christmas cup incident occurred, said YouGov, Starbucks fell from a Buzz score of 11 to -9 in four days too, eventually hitting a bottom of -13 the next day. The 2015 incident involved the company's holiday cups that were solid red and offended some customers. YouGov's Buzz score can range from -100 to 100 with a zero equaling a neutral position. So, a score of 35 means that 35% more people said they were positive than negative about the brand.